Waru Tjukurrpa relates to Fire Dreaming and the use of fire for hunting and for land management on traditional Aboriginal lands. Jorna Newberry has extended the imagery and story that she has previously represented under the title Walpa Tjukurrpa, or Wind Dreaming. Both these Dreaming stories relate to Jorna’s mother’s country at Utantja, on Pitjantjatjara country near the intersection of the three state boundaries of Western Australia, Northern Territory and South Australia. 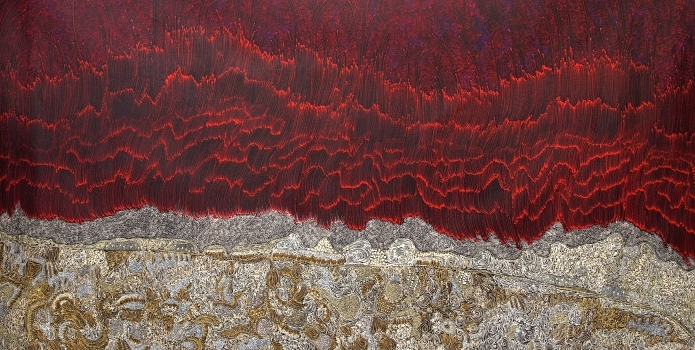 In the paintings Jorna Newberry has represented the land (area in white) being burned off in a controlled way. The swirling areas of red indicate the fire and the effects of the wind. The people would stand down-wind to create the line of fire. As it moved forward the fire would flush out lizards, snakes and goannas, which hunters ahead of the fire would attempt to kill. Jorna describes her mother’s country also as being filled with kangaroos and camels, rock wallabies and birds – larger game that was attractive to the hunters. Jorna’s mother’s country at Utantja is described as a large stretch of sacred ceremonial land located amongst hilly country, where a large rock hole provides sufficient water for people to gather in significant numbers. It is here that people come together at appointed times to prepare for ceremony, involving painting up with ochre in traditional designs, singing the sacred Tjukurrpa song cycles and ceremonially dancing the symbolic journey of the ancestors. When these larger groups of people gather together for ritual ceremonies it is important that they can gain enough food from the land to feed everyone. For this reason the focus on managing both fire and wind gains extra importance as part of the ceremonies. In these paintings of the Waru story, Jorna uses the vibrant contrasts of colours to show the movement of the wind creating eddies over the land, and steadily growing larger as it surges across the open country.